Simply Sanibel Poems is a treasured collection of poems from Sanibel Island, Florida, one of the 10 best shelling beaches in the world. 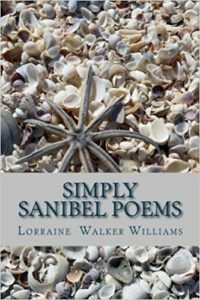 Award-winning poet, Lorraine Walker Williams will take you on a poetic journey where you will sink your toes in the sand, meander the bike paths of the island and encounter tropical birds, dolphin and native wildlife. These poems reflect keen observation and attention to detail in communicating with strong imagery and deep feeling. Dream of the sea, inhale the salt breeze and let peace settle in what life can be on an island sanctuary.